Odissi guru Jyoti Rout says that one of the highlights of her life as a dancer was having the opportunity to perform in the Jagannath temple in Puri in 1993. An Odissi dancer and teacher who is truly devoted to her art form, Jyoti says that her greatest joy would be to be born again and again as a dancer to share the spiritual essence of Odissi with the world. Jyoti Rout, originally from Orissa, India, received her training at Utkal Sangeet Mahavidyalaya, a college of music and dance in Bhubaneshwar, under the guidance of Guru Deba Prasad Das and Guru Pankaj Charan Das. There, she received a master’s degree in Odissi dance, as well as a degree in classical singing and in Chhau dance. 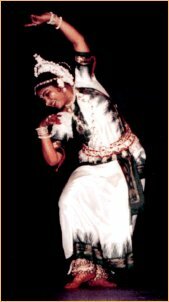 Following a successful Odissi career in Orissa, Rout went to the United States in 1993 to, as she says, bring the message of peace to the world through dance as a spiritual practice. Once there, she founded Jyoti Kala Mandir College of Indian Classical Arts, a nonprofit school for Odissi training. Currently, the school has about seventy students, who are all offered excellent opportunities to study Odissi dance intensively and to immerse themselves in the culture and art of India. In addition to classes and workshops in California and Hawaii, students are invited to Bhubaneshwar each winter to Jyoti Kala Mandir’s sister school for a month-long dance workshop. Rout’s Odissi, full of the grace and beauty that has become the dance form’s hallmark, has been most exceptional for its range and depth of expression. In her dance, she moves between rage, love, fear, and amusement with ease. And even within each emotion, she conveys subtle, almost imperceptible shifts in feeling with perfect clarity. She achieves each emotion with such a genuineness of feeling that everyone who sees her is touched. Since moving to the United States, Rout has continued to perform extensively as well as broadening her focus into choreographing new pieces. Her original dance dramas include Srushtire Nritya, Om Namah Sivaya, Krishna Leela, Sri Jagannath, Ya Devi: The Living Goddess, Buddha: The Path of Light, and Konark: Temple of the Sun. She has also choreographed countless solo items, including Ashtanayika, Draupadi, Trinath Mangalacharan, Misra-Aravi Pallavi, Kasturi Tilakam, and Siva Tandava. Rout’s choreography skills are outstanding, as she uses innovative poses to create memorable stage pictures. Beyond her many accomplishments, what is so striking about Jyoti Rout as an Odissi dancer remains her approach to the art form as an act of worship rather than just a medium for performance. The divine nature of Odissi shines through in this radiant dancer, teacher and choreographer. To find out more about Jyoti Rout or Jyoti Kala Mandir College of Indian Classical Arts, visit the Jyoti Kala Mandir website at www.jyotikalamandir.org. You will find a full schedule of Odissi dance, Odissi Pakhawaj (drum) and yoga classes as well as information about upcoming performances and events. Writer Shalini Goel holds a master’s degree in English from the University of Chicago. She is a lover of the Indian arts, a long-time student of Bharatanatyam and a current student of Odissi under the tutelage of Jyoti Rout. Shalini has studied Odissi intensively at the Jyoti Kala Mandir School in Bhubaneshwar, Orissa and is currently pursuing a law degree at UC Berkeley.